The GXV3175 represents the future in personal IP multimedia communication. 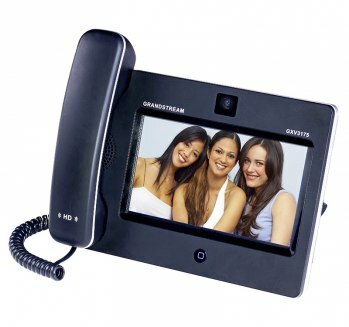 Stunning video quality, intriguing user interface with delightful details, rich Web applications embodied in a sleek tablet-like design, distinguished this product as the ultimate desktop multimedia phone. The GXV3175 sports a large 7" touch screen color LCD, a tiltable mega pixel CMOS camera with razor sharp clarity, dual network ports with integrated PoE, integrated WiFi, comprehensive auxilary ports, and support for advanced video compression standard H.264/H.263/H.263+. The GXV3175 redefines the desktop communication experience with a raised level of innovation and integration of state-of-the-art real time video conference, personalized rich media presentation and delivery, popular Web and social networking applications, and advanced business productivity tools.